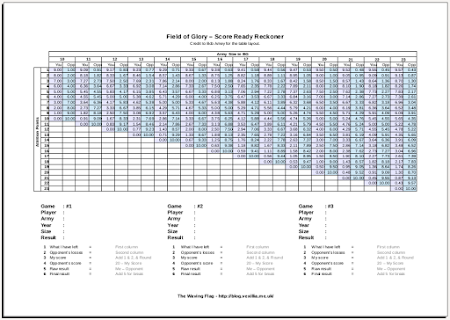 On Sunday I posted some sheets that I'd developed to speed up the calculation of the scores at the end of games of Field of Glory. Since then I've had some feedback and a very useful suggestion from Bob Amey. Sheet #3 is a 650 point scorecard for up to 4 games. This covers armies up to a maximum of 18 battlegroups. Sheet #4 is an 800 point plus scorecard for up to 3 games. This covers armies up to a maximum of 23 battlegroups. Both sheets have space to record all the details of the opposing army, the score calculations and the final results. In both cases I kept the cell size reasonably large to maintain readability. Of course this restricts the size of the grids a touch but these should do for most games.